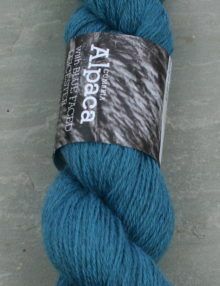 MORECAMBE DK 70% Yorkshire Blue Faced Leicester wool, 30% British Alpaca, spun in Yorkshire. 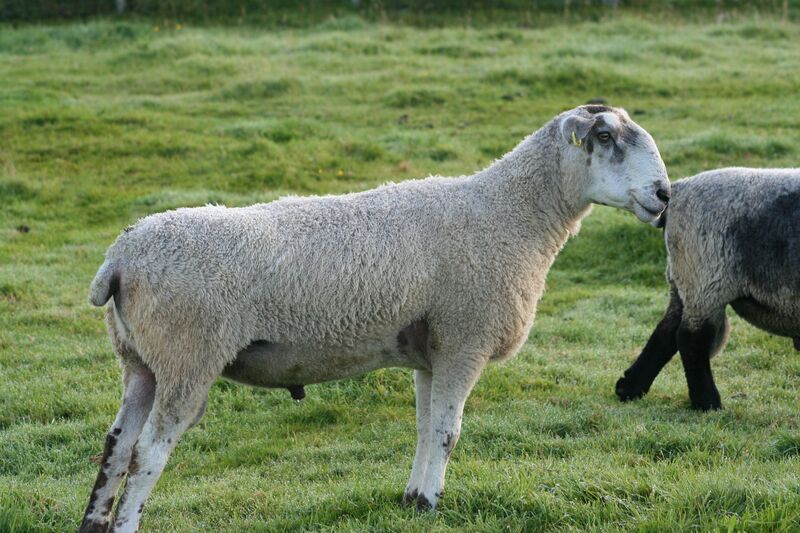 Many farmers in the North keep small flocks of Blue Faced Leicester alongside their hardier fell sheep. They don’t usually get a premium for this fine, semi-lustrous wool as the wool goes in the bale with the rest. We collect it from my neighbours and around the Yorkshire Dales, Cumbria and as far out as County Durham. 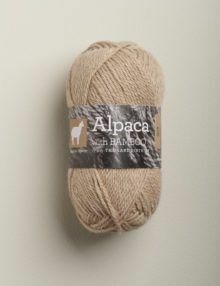 The alpaca fibre comes from breeders all around the UK. 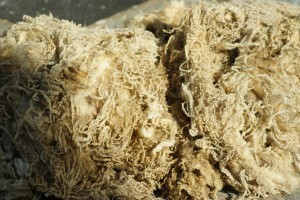 I buy the raw fleeces and spend a long time preparing them for scouring. 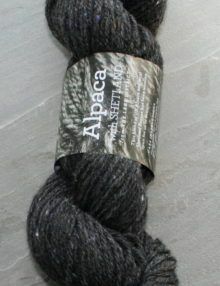 We use both Huacaya and suri fleeces, but this batch of yarn contained mainly huacaya, only because there are more of these. I carefully remove hairy sections, vegetable matter and short fibres. 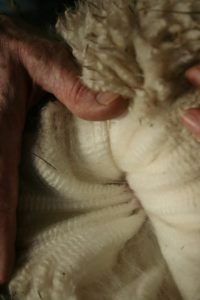 The fleeces are then graded by their colour, length and fineness. The Blue Faced Leicester fleece is very fine compared with other British sheep breeds. The locks have a distinctive curl rather than a crimp. 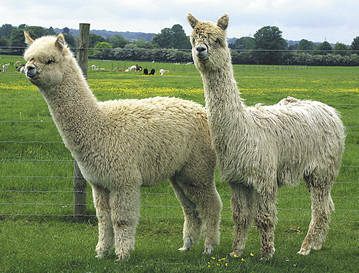 The staple is longer than many lowland breeds, but not as long as that of Wensleydale or Teeswater sheep. It tends to be very greasy and is cold on the hands sorting during the winter months. 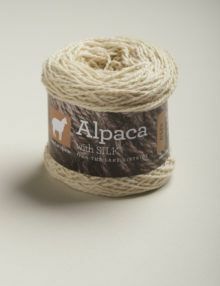 Alpaca fleece varies considerably in staple length, crimp and fineness. It takes a long time to sort each fleece, particularly the very fine fleeces which have a lot of hay and twigs caught up in them. There is little lanolin on the fleeces, but they can be very dusty or sandy depending where in the country they have come from. The fleeces were from animals sheared in the summer of 2015. 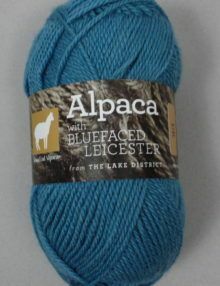 We collected the Blue Faced Leicester in the Autumn and I spent the Winter and Spring sorting through them ready to be sent off to be turned into yarn. 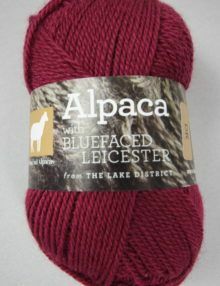 I ended up with 400kg of sorted alpaca and Blue faced Leicester, which was fine and long enough to be turned into a special Double Knitting Yarn. That’s a huge amount of fleece for me, the largest batch I’ve ever had, but for the processors in Yorkshire, it’s almost too small for them to consider. 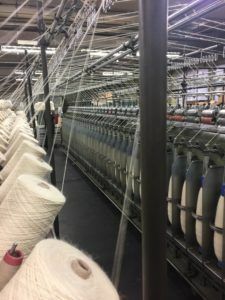 Although I live close to what remains of the wool industry in Yorkshire, I’ve used smaller mills in other parts of the country who undertake the end-to-end process from fleece to yarn. 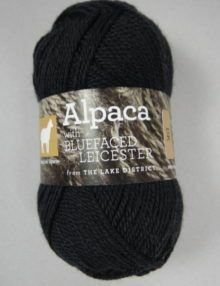 My aim was to take a massive step up and get together a large enough batch so that I could have the fleece spun locally. The first challenge was to get the 400kg to be scoured (or washed) in Yorkshire. I don’t have the equipment to handle big wool bales, so it was packed in eighteen 20kg sacks. By the time I had found someone to take it, the scourer was busy with the next summer’s fleeces and I had to wait until they had a slot in July. The fleece was scoured, dried and opened into fluff. I lost about 35% of the fibre in weight, mainly lanolin and dust which was a bit painful after spending all that time sorting it! I then had to find a company prepared to turn a relatively small quantity of fluff into tops. Tops are thick ropes of clean, combed fibre. The combing removes any remaining bits of hayseeds and other vegetable matter. For worsted spinning, you need longer fibres, so the combing also removes the shorter fibre. 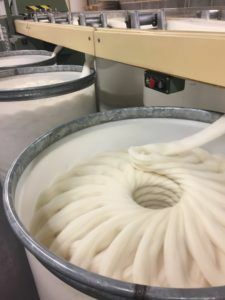 You can see my beautiful soft ivory tops coiled into cans ready for spinning. 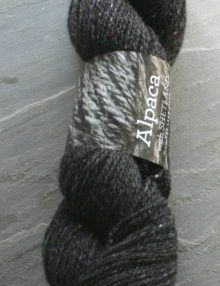 I had to wait another few months to fit into the comber’s schedule when they were combing some other alpaca fibre. The tops were ready at the end of September. They sent the waste fibre back to me to see if I could find a use for it. Sadly, it was full of hayseeds and other bits, so it went on the compost heap. Despite having carefully sorting the fleeces (so I thought) to remove the shorter fleeces, I was amazed that I lost about 20% of the fluff through combing out the short bits. From there, the tops went to be spun at another company in Yorkshire. 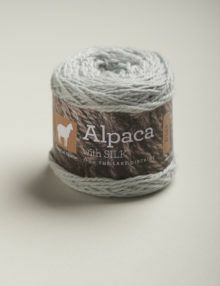 The tops were gilled some more to ensure the alpaca and Blue Faced Leicester wool were fully blended together. 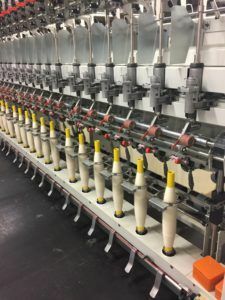 The fibre was then spun into a single long, fine thread and then several of these single threads were twisted or plied together. Here’s my yarn being spun. I like to have at least three singles plied together to give a rounded yarn and I wanted the resulting yarn to have 250m per 100g. I received a couple of samples from the mill to decide how much twist wanted. 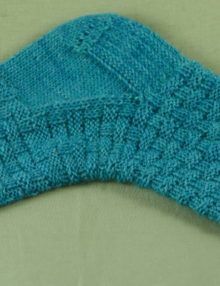 I chose slightly more twist to avoid pilling of the yarn. This photo show my yarn being plied. 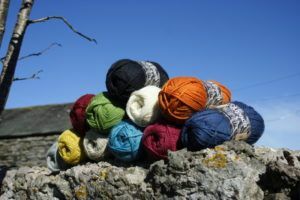 The yarn was spun and plied by the middle of January and went to the dyer in the Scottish Borders. I sent them samples of the shades I’d spend months choosing. The hanks of dyed yarn were returned to the spinner for balling. Finally, 24 boxes of yarn on two pallets arrived back at the farm for me to unpack and put ball bands on. Out of 400kg of fleece I’ve ended up with 175 kg of colourful, springy, soft yarn. 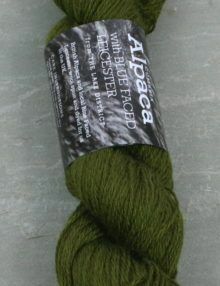 Morecambe is a worsted spun blend of 30% British alpaca and 70% Yorkshire Blue Faced Leicester wool. It’s sold in 50g balls which have approximately 125m. 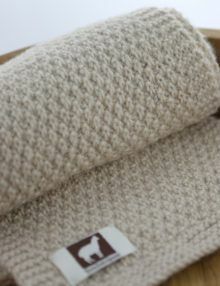 There are eleven shades in total, one of which is the natural ivory of the fleece. 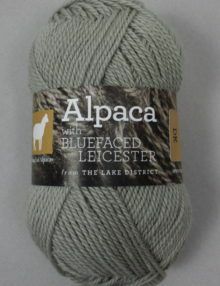 The purer white of the alpaca countered the slightly yellower Blue Faced Leicester fleeces to produce an ivory yarn. 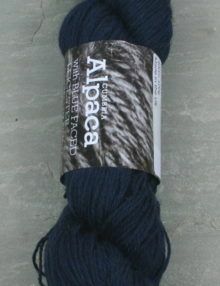 The yarn is well twisted and has a natural sheen from the Blue Faced Leicester wool. 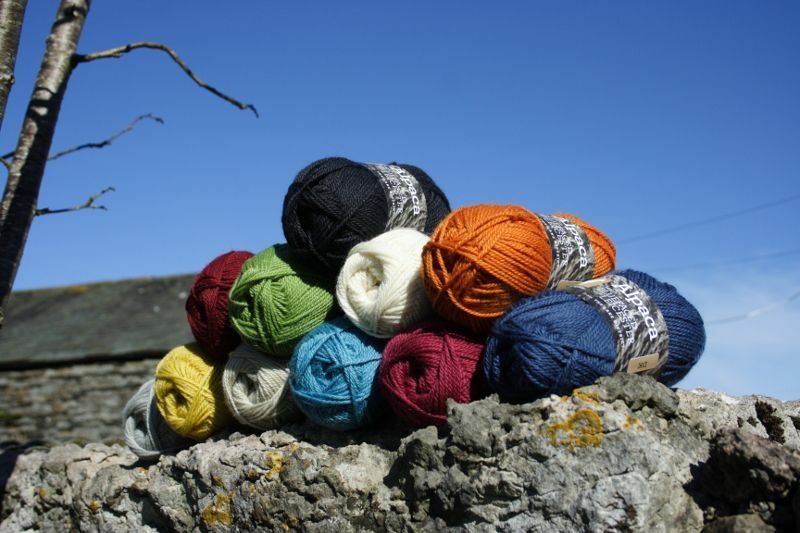 I’ve chosen a palette of bright colours and some neutrals which sit well together and will look good knitted into cardigans or jumpers. I always struggle how to name products and describe colours, so I’ve started to name them after things with which I have an affinity. We live a couple of miles from Morecambe bay in the South Lakes. 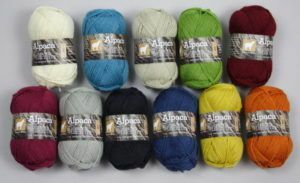 The different shades of the yarn are named after the major rivers and islands in our part of the bay. ‘Sheep’, which is what we have called the natural ivory, is the name of one of the small islands in the bay. The other islands are Roa (warm raspberry), Piel (burnt orange), Barrow (putty) and Walney (gold). The bright, fresh green is Winster which is the river in whose valley underneath Whitbarrow scar our farm is situated. The other rivers around us are Leven (light French navy), Gilpin (light grey), Greta (Charcoal grey), Kent (bright blue) and Lune (maroon). 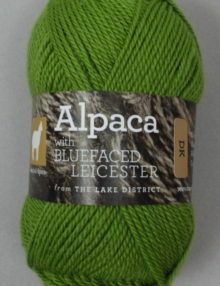 I hope that you enjoy this yarn. 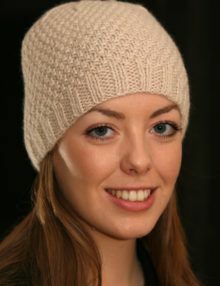 Please send me your feedback as I work on the next batch and photos of what you have knitted or crocheted in it.